Welcome to Mr. Pick's Railroad Picture Archives! Welcome to the RRPictureArchives.NET contributor site of Mr. Pick. 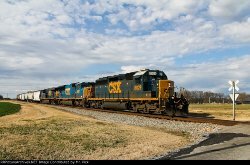 What you'll find here are mostly pictures taken along the Chattanooga Sub of the Nashville Division of CSX. I live along this line and have always been fascinated by it and its history. SUNNY Day on the J line.